Galen Leather Pencil Cases — the weekly pencil. I'm a creature of habit and don't often stray from products I enjoy using. If I find a bag, pencil case, sharpener, eraser, etc. that I like, I forever use it. I'd say one of my faults is not straying from things I love, so that's why when I got an email from Galen Leather about reviewing their products, I was inspired to step outside my box of stationery accessory monogamy and try something new. Before I get to the good stuff, let's talk about Galen Leather as a company. Like most reviews I do, I start by reading over a manufacturer's website to get all necessary details about the products I write about. Galen Leather's story is not only amazing, it's deeply inspiring. The owner of the company, Zeynep, was diagnosed with cancer in 2012 and lost the ability to talk for a year. Because of this, she had to leave her career and find something new to pursue since she was unable to communicate verbally. That's when Galen Leather was born. I won't take up much space getting into the details, but you should read about it here. It's worth it. Okay. So the two products I am going to review today are the Student Leather pencil case and the XLarge Zipper pencil case. Galen Leather's products are packaged beautifully. The sturdy kraft boxes have a nice black stamp on the surface with the company's logo. 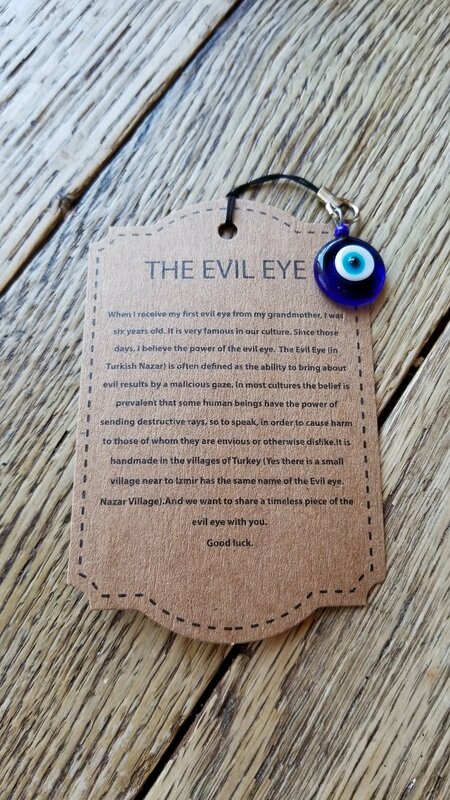 Inside each product is a care card and a small evil eye charm with a strange, yet fascinating story about the origins of the evil eye. Anyhow, A++ on presentation and packaging. First up is the Student Leather case. This pencil case looks great-- it is made of vegetable tanned leather and features brass hardware with an unlined interior. The design is simple and is made of a single piece of leather. I will say the leather is a bit stiff, but this will change once you use it a bunch of times. Included with all of their products is a care card which will give you advice on how to take care of your leather. All edges on their products are burnished which gives them a nice clean, finished look. The Student Leather case can fit 18 pencils, unsharpened Blackwings, and its slim profile makes it easy to slide into a bag or purse. I will say that undoing the clasps at first is a bit difficult-- this is due the the stiffness of the leather and will get easier over time. What I would suggest is to open and close the case several times to work the holes in the leather a bit. The other case I am reviewing is the XLarge case. This case is a classically styled zipper case with a YKK zipper, a leather zipper pull, and a lined interior-- it definitely lives up to it's name-- it's HUGE! This case can fit 48 or so pencils and will fit an unsharpened Blackwing sideways. It's not ideal, but it works. Again, the leather is a bit stiff and the design of the case is such that it is slightly triangular so it stands up on it own. This makes it a bit bulky for a bag, but not so much that one wouldn't want to carry it. As I use this case more and oil the leather, I predict it will become a lot more pliable and less bulky feeling. This case would be good for not only pencils, but accessories like erasers, sharpeners, and highlighters since it is quite deep. The zipper is smooth as butter and the hand-stitching is on point. I'd recommend this case wholeheartedly. I unequivocally recommend anything by Galen Leather. The quality of their products is outstanding and their customer service is wonderful (I had communicated several times with the owner and she was responsive and informative each time). Their items ship from Turkey, but I got them quick-- it took a little over a week for my stuff to arrive via UPS. I did not have to sign for the package and it was left at my doorstep which was a bonus since I hate going down to FedEx or UPS to sign for something.